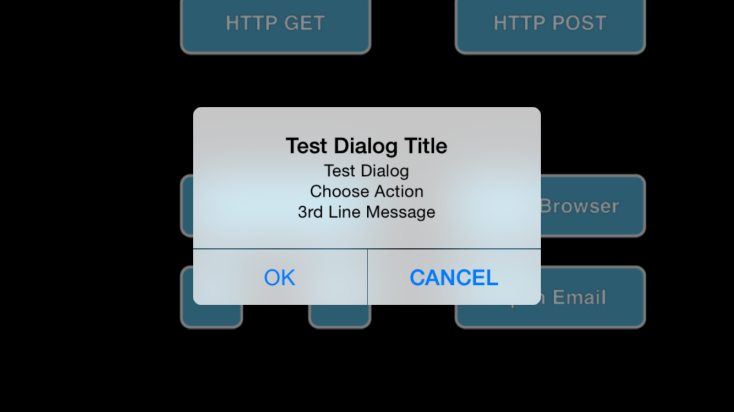 Usually dialogs are created in accordance to the app's design. 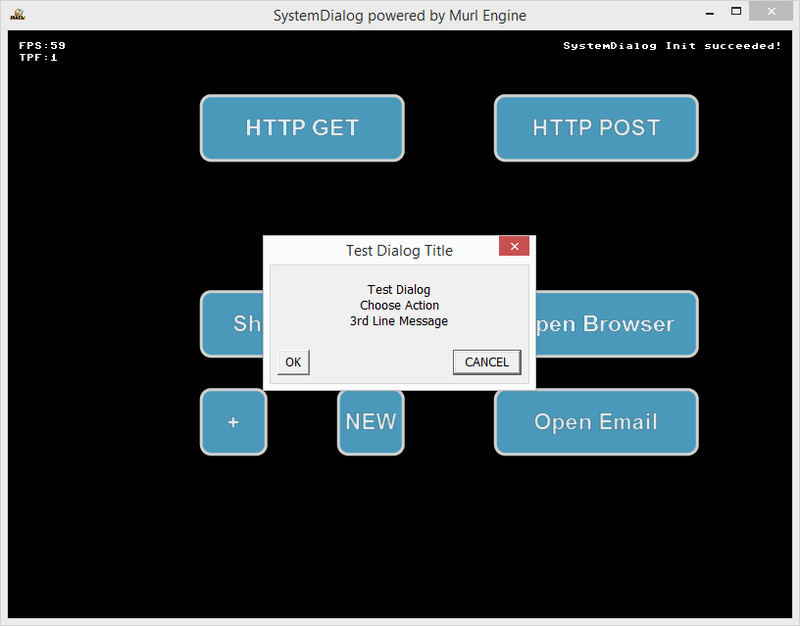 This means that dialogs are also built up by several graphic nodes such as all other elements of the application. In some situations, e.g. when querying, if an app should be closed, real system dialogs are preferred. 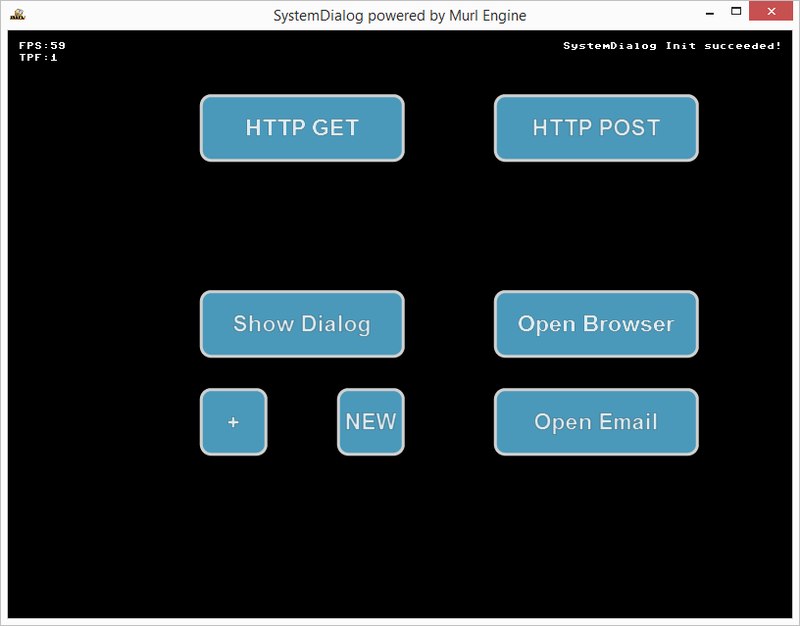 The Murl Engine provides the possibility to display a simple system dialog and to query the corresponding user input via its ISystemDialogControl interface. If a ISystemDialogControl is provided on the platform, a ISystemDialog object can be created via CreateSystemDialog(). 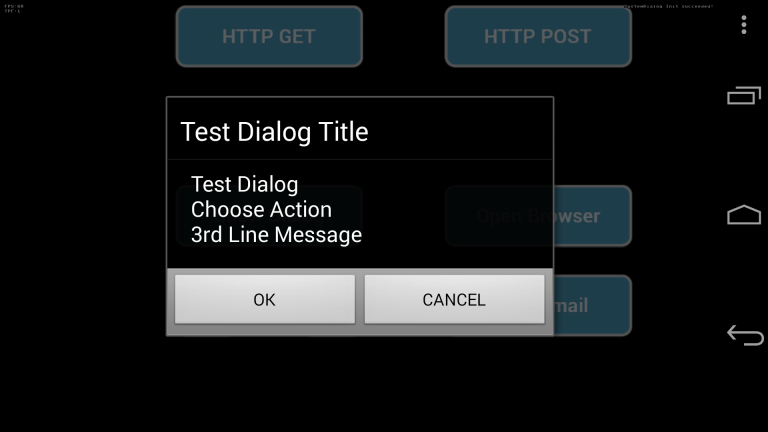 A dialog is displayed via the Open() method and can be closed via Close(). For our example we use the 9 slice button from the previous tutorial and create three button instances. In the header file, we create member variables for the buttons and a pointer to store for the ISystemDialog object. The mSystemDialog pointer is initialized to 0 in the constructor. In the OnInit method, the Logic::ButtonNode member variables are initialized with the references of the button nodes. Additionally, a ISystemDialog object is created and the object pointer is stored in the mSystemDialog member variable. 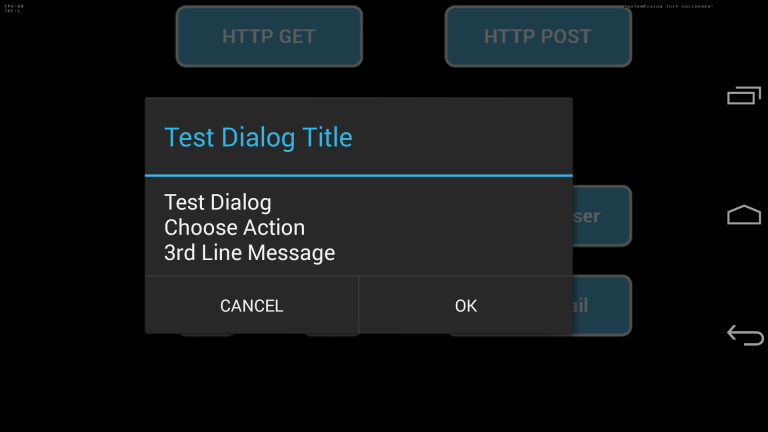 We also pass the title and the info message of the dialog as parameters to the CreateSystemDialog() method. The created ISystemDialog object has to be destroyed (released) with DestroySystemDialog(). This can be done in the OnDeInit method. The dialog should be opened when we click on Button01 or when we press the D key. The dialog window is automatically closed when we click on a dialog button. Additionally we implement an auto-close-timer which closes the dialog automatically after a timeout of five seconds. With GetClickedButtonIndex() or GetButtonLabel() we can find out onto which button was clicked. We use the mButtonPlus button in order to add another button to the dialog. Caution! On the Android operating system the maximum number of visible dialog buttons is limited to three. The button mButtonNew destroys the current ISystemDialog object and creates a new one. Again we use some additional 9 slice buttons and ButtonNode member variables to trigger the different IWebControl functions. The method OpenUrlInSystemBrowser() with the web address as parameter can be used to open a website. The entered web address is opened in the default browser. In order to send emails we first need to create an IEMail object. To reference this object we define an IEMail* mEMail; pointer in the header file and initialize it to 0 in the constructor. The CreateEMail() method creates an IEMail object and returns a pointer to the object. With the Send() method we open the email client and the email can be sent by the user. Caution! The WasSaved(), WasCancelled() and WasRejected() methods give an accurate result only with iOS. All other platforms return for WasSent() true as soon as the email was successfully handed over to the email client. A verification, if the user has actually sent the message or if the email was e.g. discarded, is not possible on any other platform than iOS. The IWebControl provides with the method CreateUrlRequest() the possibility to create an IUrlRequest object which can be used for HTTP calls. To reference the IUrlRequest object we define an IUrlRequest* mUrlRequest; pointer in the header file and initialize it to 0 in the constructor. In the OnInit method we create an IUrlRequest object and store the pointer of the object in the mUrlRequest member variable. The created IUrlRequest object has to be destroyed (released) with DestroyUrlRequest()! This can again be done in the OnDeInit method. In order to send an HTTP request with HTTP GET, the SendGet() method can be used. The HTTP address is passed as parameter. Of course the HTTP address can also contain HTTP GET parameters, e.g. The size of the received data can be queried through GetCurrentDataSize() and the actual data through GetResponseData(). The example code above outputs the first 1024 bytes as debug message. URL request is pendind. Received 0 bytes. URL request is pendind. Received 3935 bytes. In order to send a HTTP request via HTTP POST, the SendPost() method can be used. The HTTP address, the post data and the content type are passed as parameters. Formula: a + b == 13%! string(13) "a + b == 13%!"